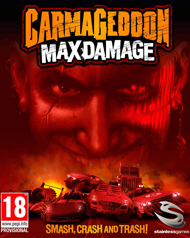 Want to get a forbidden thrill from one of Carmageddon's big selling points, maximum pedestrian carnage? You won't get one from plowing through these poorly-modeled, boring people. They have no personality aside from the varying outfits that they wear. There's little impact when you hit them, just the occasional flying body part. Their sound effects are dull. In fact, you barely notice them aside from the occasional pop-up that you've gotten extra points for "bacon splatter" or whatever. Pedestrian carnage may not be my personal preferred brand of humor, but I can't imagine this getting more than the occasional chuckle even out of those who enjoy it. How about those awesome power-ups that the game advertises? Maybe they're out there, but the ones I found were either dull or confusing. Your car can turn to granite, but it doesn't seem to drive any differently. You can make the arms come off the local pedestrians or make them dance, but neither of those things is even funny because of how poorly the peds are modeled. Even the best of the power-ups I found came with so few audiovisual bells and whistles that it was hard to get excited about them – though there was that one time I started hearing the Hallelujah Chorus every ten seconds for no apparent reason. That was weird. The UI looks great! Too bad the rest of the game is all muddy textures and personality-free areas and vehicles. Overly twitchy, especially the camera, and frustratingly low-impact when it comes to combat. Generic, lazy metal soundtrack and low-octane sound effects fail to excite. 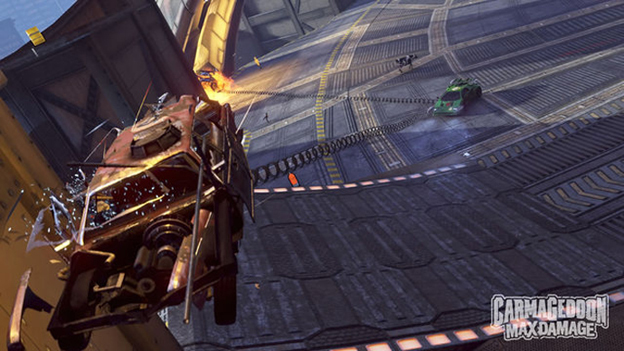 Despite some varying maps, vehicles, and course goals, Max Damage just isn't interesting or exciting enough to inspire extended play.